Attractions in Carlisle , Cumbria. Discover stories of ordinary people doing extraordinary things. Cumbria’s Museum of Military Life is located in Carlisle Castle in the newly refurbished Alma Block. Explore a fantastic new exhibition charting 300 years of The Border Regiment and its successors; The King’s Own Royal Border Regiment and The Duke of Lancaster’s Regiment. See the Bible that stopped a bullet, experience what being in a First World War trench looked and sounded like and get up close to a large array of weapons and uniforms from the 18th Century, through the World Wars, right up to modern day. As well as informative graphics the Museum tells the stories of Cumbria’s County Regiment via narrated audio/visual displays throughout the exhibition. During your visit you can enjoy a light lunch or drink in our cafe or take home a souvenir from our gift shop. Facilities also include function and conference space, bar and fully fitted kitchen which are available for hire. We also have toilets and full disabled access. The Museum has dedicated research facilities for families looking for information about former soldiers who served with The Border Regiment and The Kings Own Royal Border Regiment. For more information about the Museum including special exhibitions, events, hiring or research please visit our website. 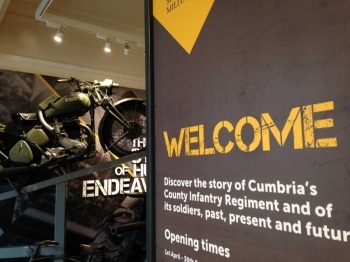 You can Follow or Like us on Twitter (@cmoml), Facebook or Google+ (search: Cumbria’s Museum of Military Life).